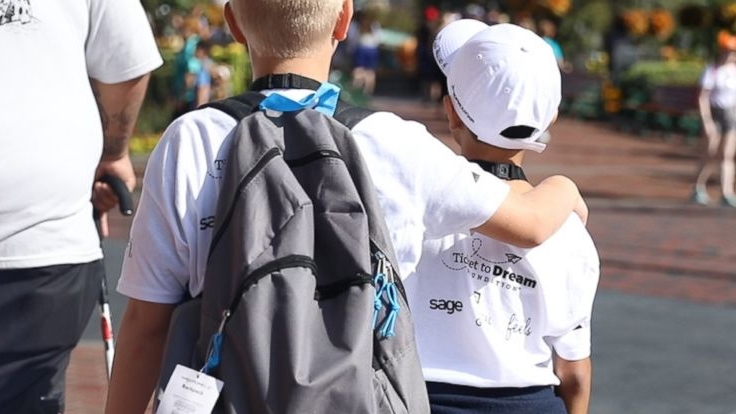 The “Disney Days” are organized by Together We Rise, a nonprofit "dedicated to transforming the way kids experience foster care in America," according to its website. (LOS ANGELES) — About 350 siblings separated in foster care were reunited at Disneyland over the weekend. The “Disney Days” are organized by Together We Rise, a nonprofit “dedicated to transforming the way kids experience foster care in America,” according to its website. “The goal is to help them create positive childhood memories with their siblings and allow them one weekend to simply enjoy being kids,” donor relations manager Steven Macias said. The kids ride the attractions, bond with their siblings, get souvenirs and eat lunch, dinner and treats, all free of charge. They call it “the best day ever,” Macias said. “We couldn’t make our Disney Days event happen without the support of our committed donors, volunteers, and sponsors,” he said. The Walt Disney Company is the parent company of ABC News.